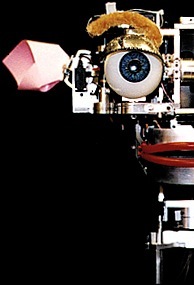 Cynthia developed Kismet for her doctoral work at the MIT AI Lab in the late 1990s. 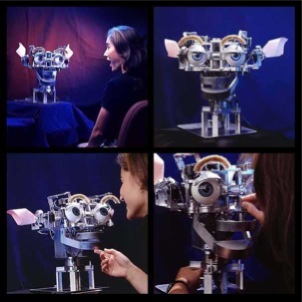 Kismet is the first robot designed to explicitly engage people in natural and expressive face-to-face interaction, and it is widely recognized as the pioneering effort in the new field of Social Robotics (or Sociable Robotics). Inspired by infant social development, psychology and ethology, this work integrates theories and concepts from these diverse viewpoints to enable Kismet to enter into natural and intuitive social-emotional interactions with a human "caregiver" reminiscent of parent-infant exchanges. These interactions are critical for infants' social, emotional, and cognitive development -- and they can also be leveraged to bootstrap the social-emotional-cognitive development of social robots (see Leonardo). The design of Kismet has been published in numerous articles and in the book Designing Sociable Robots (2002). Breazeal, C. (2000), "Sociable Machines: Expressive Social Exchange Between Humans and Robots", Doctoral Dissertation. Department of Electrical Engineering and Computer Science. MIT. George M. Sprowls Award for Outstanding Ph.D. Thesis in Computer Science.